The Department of Environmental Conservation's annual Angler Achievement Awards Program that recognizes anglers who make exceptional catches begins its 27th season, DEC Acting Commissioner Basil Seggos announced today. 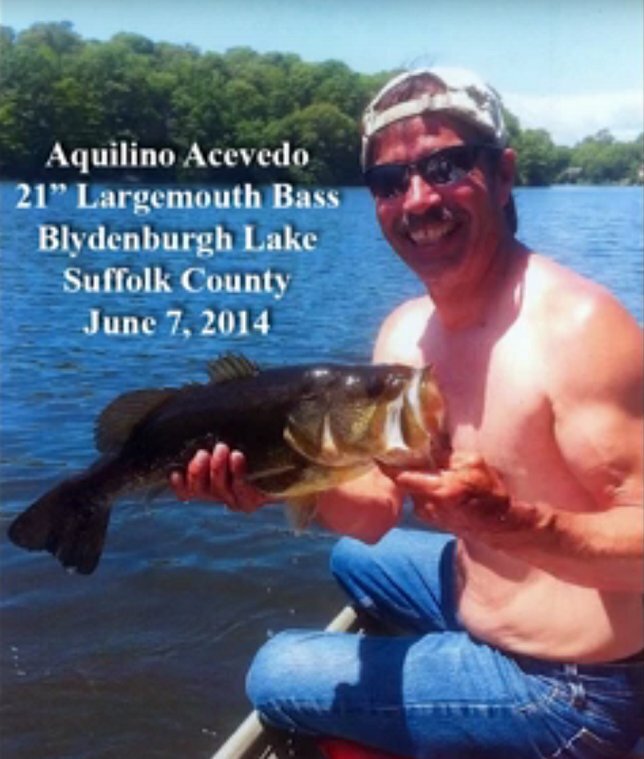 Aquilino Acevedo - 21" Largemount Bass at Blydenburgh Lake in Suffolk County on June 7, 2014. Photo by: NYS DEC, via YouTube. Albany, NY - April 18, 2016 - The Department of Environmental Conservation's annual Angler Achievement Awards Program that recognizes anglers who make exceptional catches begins its 27th season, DEC Acting Commissioner Basil Seggos announced today. "The Angler Achievement Awards are a popular way to recognize the outdoors people who have made notable catches in New York's water," Acting Commissioner Seggos said. "New York is fortunate to have a wealth of amazing fishing opportunities, and this awards program showcases the best catches of the year and the record fish New York has to offer." The awards recognize the anglers who caught the heaviest freshwater fish of the year from 43 different species in New York State's lakes, rivers, ponds, and streams. Each fish entered must meet or exceed the minimum qualifying weights. The three categories that make up the program are: Catch and Release, Annual Award (kept fish) and State Record. The winning anglers are awarded an Angler Achievement Award lapel pin and a Certificate of Achievement suitable for framing. Those who catch a trophy-sized fish have a chance at establishing a new State Record. In addition to providing deserved recognition to those anglers catching trophy fish, the program also provides a useful snapshot of the quality of the state's freshwater fishery. The Angler Achievement Awards Program is comprised mostly of New York resident anglers, but in 2015 an additional 13 states were represented, including a "Catch and Release Award" recipient hailing from Hawaii. Of the 150 entries submitted into the program last year, almost 75 percent of those qualified under the Catch and Release Category, indicating the sound stewardship ethic of New York's anglers. Sixteen fish qualified in the Annual Award (kept) Category, with brown bullhead and black crappie making up the majority. Although warmwater fish species such as bass, crappie, pickerel and sunfish comprised well over half of the entries received, there was a slight increase in the number of trout entries compared to previous years. Joshua Wegner established the one and only state record for 2015 with a 5½ lb. white sucker from Cold Brook (Steuben County) on April 14, 2015. It surpassed the previous state record set over 20 years prior by five ounces. Other notable catches include an impressive 37-inch steelhead caught and released from Sandy Creek (Monroe County), a northern pike weighing over 31 pounds caught in Great Sacandaga Lake, a 24-inch largemouth bass caught and released from Guilford Lake (Chenango County), and a 31-inch brown trout caught and released from Walton Lake (Orange County). Fish from waters in 44 of New York's 62 counties were entered into the program in 2015. More information about the Angler Achievement Awards Program, including a downloadable application form and photo slideshow of fish entered, can be found on DEC's website. Full program details and an entry form can also be found in DEC's current Freshwater Fishing Regulations Guide. For additional information on the Angler Achievement Awards Program contact (518) 402-8891 or email. Subject: LongIsland.com - Your Name sent you Article details of "DEC's Angler Achievement Awards Program Begins Another Season"